My guest blogger today is Tracy Robbins. Tracy and I met online because we both have an interest in and passion for God's creative masterpieces. In fact, when I first asked her to guest on my site, she couldn't get back to me for a couple of days because she and her family were enjoying God's great outdoors during a mini-vacation! Tracy writes at HappyHealthyandProsperous.com. Read her words below and then connect with Tracy on her site. I know you're going to enjoy her words as much as I do! By Tracy Robbins ©2016, Originally Published August 16, 2016 at HappyHealthyandProsperous.com. Used with permission. 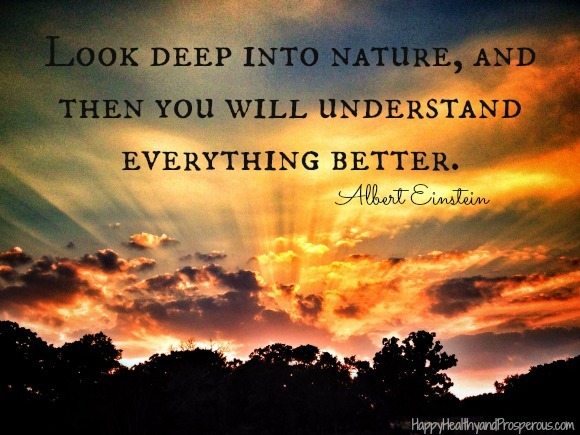 Any nature lovers out there? Picture me raising both hands. I absolutely LOVE being outside (weather permitting) and being around nature. There’s just something about seeing creation in all of its shapes and forms. As a result, I feel like I connect with God through nature. Now, I know this is probably not the case for everyone. Hence, this is only one of many ways of connecting with God. There are loads of people I know who love and prefer their creature comforts…namely indoor air conditioning and heating! However, I still think even those who prefer to remain indoors have something to gain by trying to connect with God through nature. Nature can reveal so much about God. There’s a lot we can learn by spending quality time in and around God’s creations. Nature reflects God and His creativity and glory. Nature displays God’s power and control. “You formed the mountains by your power and armed yourself with mighty strength. You quieted the raging oceans with their pounding waves and silenced the shouting of the nations. Those who live at the ends of the earth stand in awe of your wonders. From where the sun rises to where it sets, you inspire shouts of joy. Nature can act as God’s missionary and can testify to His existence. We can see that God will take care of us by looking at nature. God reminds us of His promises and His faithfulness through nature. Well, for one, I’m sitting outside right now as I write this! :) My wonderful husband built a deck for me for Mother’s Day because he knows how much I love being outside (as does the rest of the family). Being in nature helps me to hear from God. Additionally, I experience and see the fruit of the Spirit (Galatians 5:22-23) when I’m in nature: love, joy, peace, patience, kindness, goodness, faithfulness, gentleness, and self-control. It was funny because just the other day we were reminiscing about the time I was pregnant with my son, and I would go outside and take naps on the swing. I would also often take both of my kids outside when they were upset as babies since it would often calm them down for some reason. When I connect with God through nature it brings His peace. God has also taught me so much just through my gardening. Seriously, I actually have writing a gardening devotional book on my to-do list because I have come up with so many spiritual analogies! I have noticed I learn from animals too! Even if it’s not YOUR nature, try to connect with God through nature this week. Try any of the following ideas or come up with a few on your own! Have a quiet time/read your bible outside. 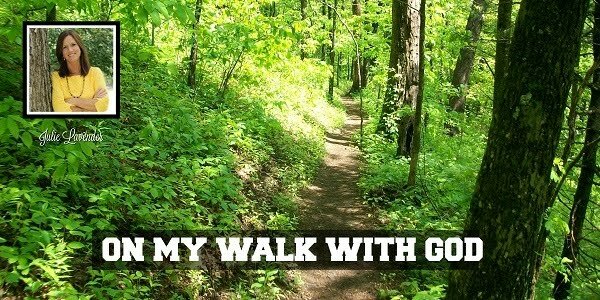 Take a walk while you pray, listen to a podcast, or listen to praise & worship music. Go out in nature somewhere that you can experience some of the fruits of the Spirit…woods, mountains, beach, garden, lake, or even a local park. Sit on a porch, talk to God and listen. Listen to the sounds of nature, and listen to God. Visit a farmer’s market and experience some of the good that God provides from nature. Do some bird or animal watching (at home or at a park, nature center or zoo) and see what spiritual lessons you can learn from observing. Do some gardening and reflect on how that process has spiritual similarities. Read about nature in the bible. Psalm 104:1-35 speaks of the great variety of things God has created and the roles that nature plays in our everyday life. Any other ideas? 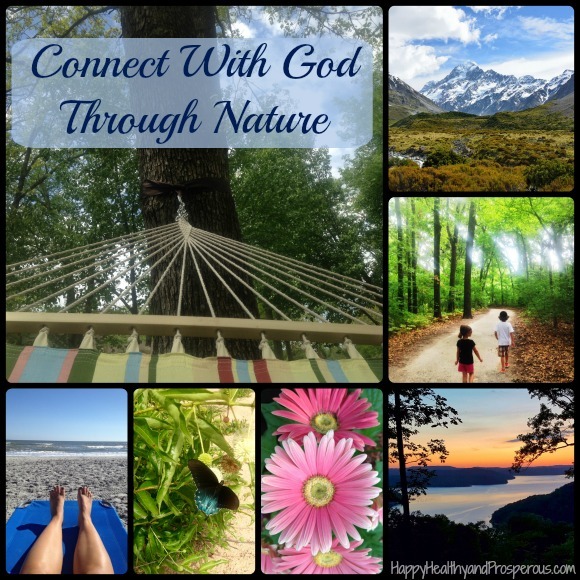 How do you connect with God through nature? What has nature revealed to you about God? 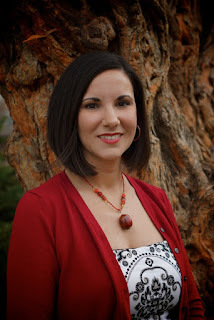 Tracy Robbins is a teacher, writer and speaker from Broken Arrow, OK. She has been married to her husband, Eric for nearly 19 years, and together they have 2 children. She is actively involved and serves in her home church, Church on the Move in Tulsa, OK where she’s been attending for over 25 years. Tracy teaches part-time at a local community college as well as for a local women’s ministry. She loves to help people grow and mature spiritually, sharing life skills for success and how to practically apply God’s Word in everyday, real-life situations. You can find Tracy blogging at www.HappyHealthyandProsperous.com. I agree that there is something about sitting next to a body of water that radiates God's peace. Thanks for the great tips! K.A.Wypych - And, I love that God treated us to different forms of bodies of water - I love the beauty of the ocean, with the loud crashing waves and the birds flying about, hoping to dive in for a fish, and the warm sandy beaches that watch the tides ebb and flow. I love a small pond that my family can toss a fishing line in and watch the ducks and toads and dragonflies that like the pond, too. And, I love a large lake that shimmers like glass on a still day. God's peace and beauty radiate from all and speak to me differently with each body of water! K.A. Wypych, So true about water! We don't currently live by water, but I told my husband that's the prerequisite for our next home! :) I don't care if it's a pond, a lake, the ocean...or even maybe on the cliffs of Italy or Greece ;) ...one of the many forms like Julie mentioned! As a nature lover, oi course I enjoyed this wonderful message. I laughed aloud when I read your son's quote, "the trees are dancing." Our children's observations are often so "true". I think God has this special way of communicating with our little ones. Perhaps that is why we are reminded to approach Him as children. Like both of you, I love being out in nature. Thanks for a wonderful post. I laughed out loud too when he said it! When I saw it through his eyes, they REALLY did look like they were dancing (we had music on in the car and they seemed to sway perfectly with the music). It still makes to smile to remember that. I think you are very right about approaching God like children...we tend to lose sight of some of those abilities to connect with God and have simple faith like that as we age. Thank you for the reminder! I'm so glad you enjoyed the post! Katherine and Tracy, I love the wind, and I love when the trees sway and blow in the breeze. I love the thought of the trees "dancing." And, though I chuckled when I read that, I love that both of you pointed out that we sometimes lose that simple faith and thought-process as we grow older. I think I'll see those dancing trees differently now!!! I've often told my own children, when I see the wind-blown trees, that I'm reminded of the verse that talks about the trees and rocks crying out, when God's people aren't praising Him. It makes me feel like the trees are raising their limbs and leaves in prayer and praise and adoration, and it reminds me to stop and praise Him! Thanks for the fun and inspiring comments!